TESTIMONIALS: See the comments participants are making about our courses. It's a testimony of quality training service. Register now and be certified for career growth. "It was nice undergoing my training at HSE Train Port-Harcourt. I really enjoyed the training. The course instructors were so nice." "I enjoyed the training and learnt many new things which I would typically take for granted. I would like to learn more in advanced courses. The trainer was very explanatory and made learning the course easy and enjoyable." "I believe it's a course every individual has to undergo whether they want to get a job or not. This course puts the individuals focused on the more important things of life. I'm glad I have gotten this knowledge and the purpose is for usage and not for storage! I'm grateful, thank you." "The training was successful, methods of teaching very good , instructors vast in knowledge and friendly in nature. I look forward to attending more courses/training with you." "It was a cool experience. The trainers were experienced and organized. I really enjoyed the training." "It was a great experience. The programe has equipped me to be prepared for any emergency at the work environment. " Storekeeper, Ahman Pategi Properties, Ibadan, Oyo State, Nigeria. "The training was very educating and it is recommended for every technical staff in the field. It was a refresher course that keeps personnel on alert in case of fire incident. " 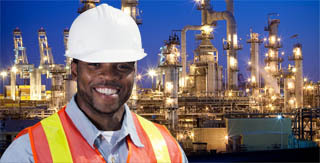 Production Operator, Platform Petroleum Ltd, Lagos State, Nigeria. "The lecture flowed well and very interactive. The practical was also very interesting "
Babcock University, Ogun State, Nigeria. "Having taken the course on safe handling of chemicals, I now have a better understanding of the hazards we sometimes expose ourselves to as a result of negligence and care free attitude. " "Generally my testimony of the program so far goes first and foremost all thanks to God almighty for the opportunity to run the program. The trainingso was a welcome and appreciable one, the company is doing a wonderful job as to have well designed safety program and qualified instructors. Finally, I will say a job well done and hope to return for further or advanced programs. Thank you and God bless." "During this training, I was widely open to how hazards, safety and environment can be of concern to humans. The training was excellent and elaborate, I learned how environment and humans can be affected positively and negatively. I enjoyed the good company and mostly the refreshment." Uniport, Port-Harcourt, Rivers State, Nigeria. "Very lovely experience. Instructor was well equiped and skilled in sandblasting. We visited several work sites, live scenerios. Alot of things learned. I am very impressed." Level 3, Rope Access Technician, Lagos, Nigeria. "The course was very understable and every facility used for the course aided understanding of the course. The entire system is commendable." Facility Inspection Engr., Integrated Oil Shore Services Nigeria Ltd, Port-Harcourt, Rivers State, Nigeria. "The training was very enligtening and easy to understand. All the required HSE guidelines needed to keep ourselves and the environment safe." Field Engineer - Drilling & Completion Fluid, Baker Hughes (a G.E. Company), Port-Harcourt, Nigeria. "Had a wonderful time throughout my training period at the institute. The staff and instructors were very friendly and organized. Would really love to be back for another training. Kudos!" "Great and awesome experience. Can't wait to get started on the next course. Thanks!!!" "The facilitators and training environment was up to standard. Also the time invested in the training was effectively utilized. Kudos to Hsetrain International for a job well done." "My training here was the best experience I have had in a class. I am looking forward to another opportunity to take another training here."